So here’s the scoop; I shut down my Etsy shop last winter after I got married (because I was kinda busy for a while… being married and all) and have been slowly working on a stash of Stuff with which to reopen the shop this August. Until then, I have a pattern to share with you – The Grubby Munchin, it’s a bib I designed a few years back and have been tweaking ever since. After a dozen or so bibs, I think I finally have it where I want it and am ready to share. This is my default baby gift. I’m not into stuffed animals or baby quilts as gifts (I have nothing against either, I just can’t make them…) and I love this bib because it’s rather durable, easy and quick to make, practical and cute to boot! If I hear that a friend, or a friend of a friend, or a distant cousin of a friend of a friend is having a baby, I get out my size 7s and start a bib. I’ve made so many, I didn’t even have a pattern… until now! 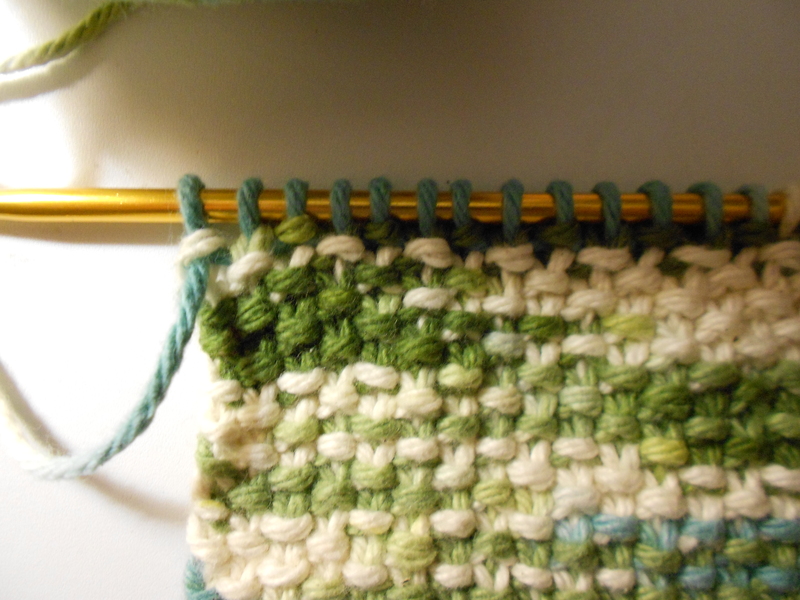 Work in Seed stitch ( knit one, purl one on one row, then purl the knit stitches and knit the purl stitches on the next… repeat) until the bib body measures 6 inches. 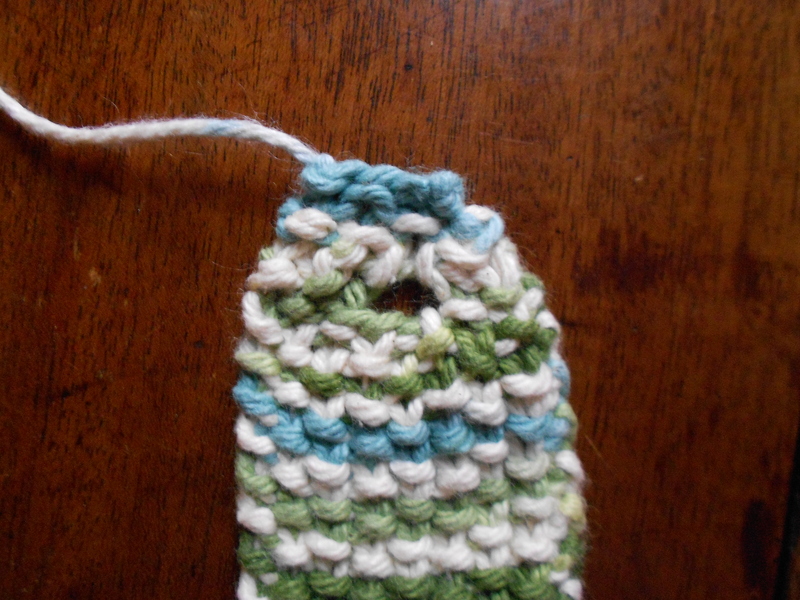 You can see the Seed Stitch detail. I like this pattern because it makes a very fine sort of fabric. 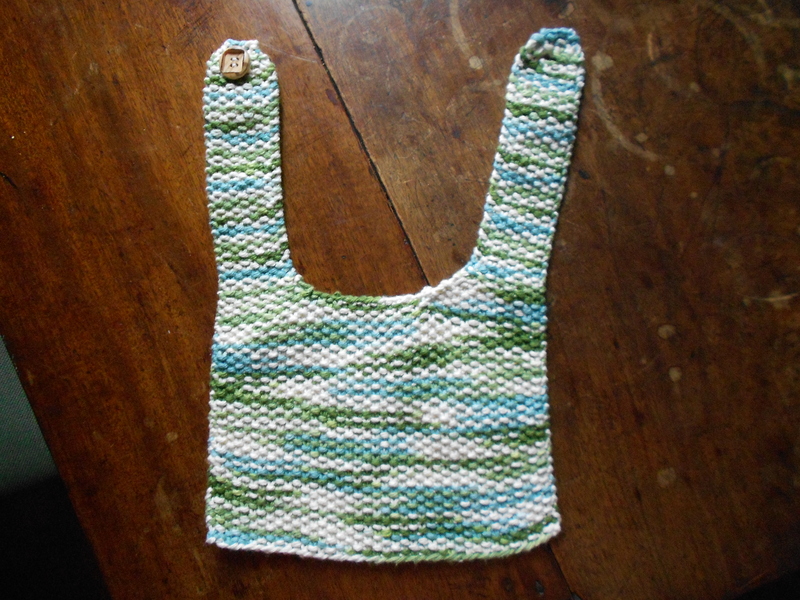 You could easily work in garter stitch (knit every stitch, every row) and have a wicked cute bib, too. These are so nice and thick and absorbent – – it really is delightful. Once the bib body is long enough (6 inches), work 14 stitches in the pattern, cast off the next 12 stitches, and then work the last 14 stitches in the pattern. Now you are only going to work the first 14 stitches for a while, making the first strap. 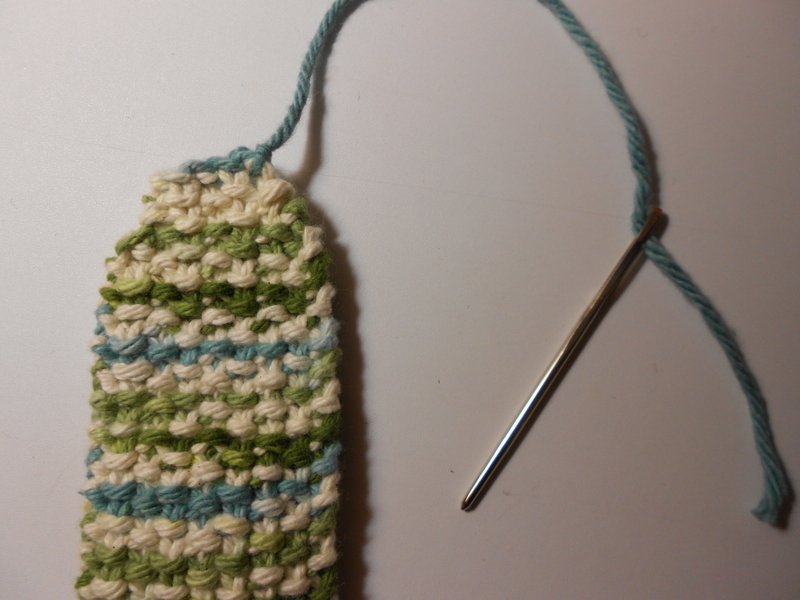 If you had a third size 7 needle, I suppose you could use that for knitting the strap, but I just slide the ‘waiting’ stitches to the back and use that needle. 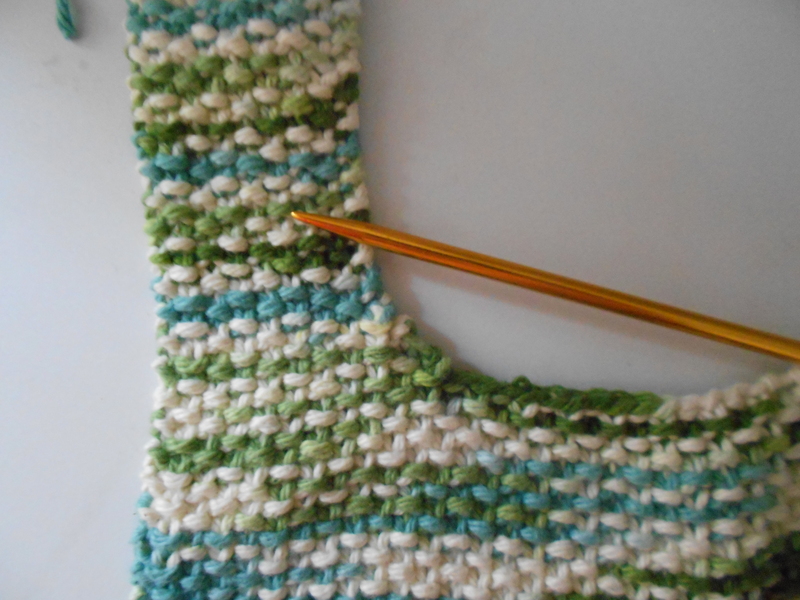 At the neck, decrease one stitch each row until you have only 9 stitches left on your needle, then work those in pattern until the strap is 7 inches. Here’s a close-up of the shaping at the neck… I think it looks more ‘finished’ than just leaving it blocky. Once the strap is 7 inches long, I like to decrease at both ends a couple of times (3 times, to be exact) to round off the top, but that is completely optional. Now, back to the other strap, patiently waiting its turn. 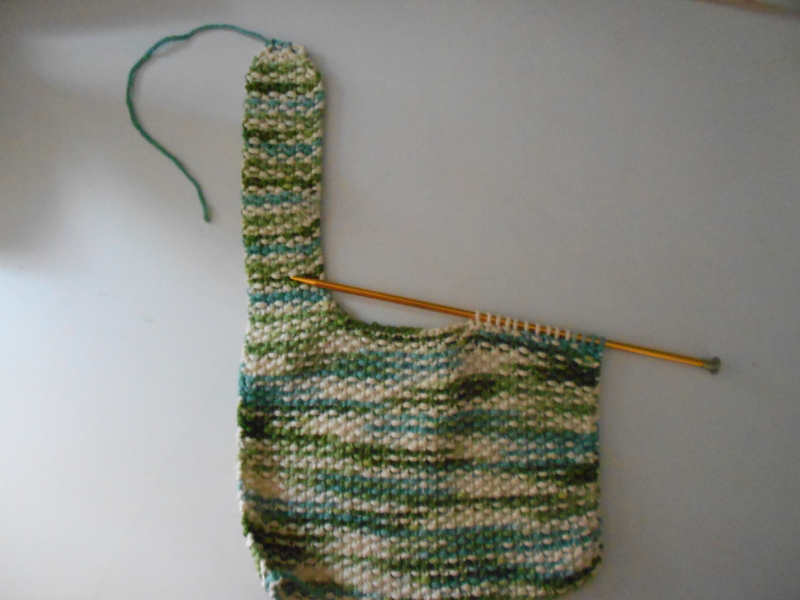 Join the yarn to the body of the bib, making sure to leave room to weave in the end. 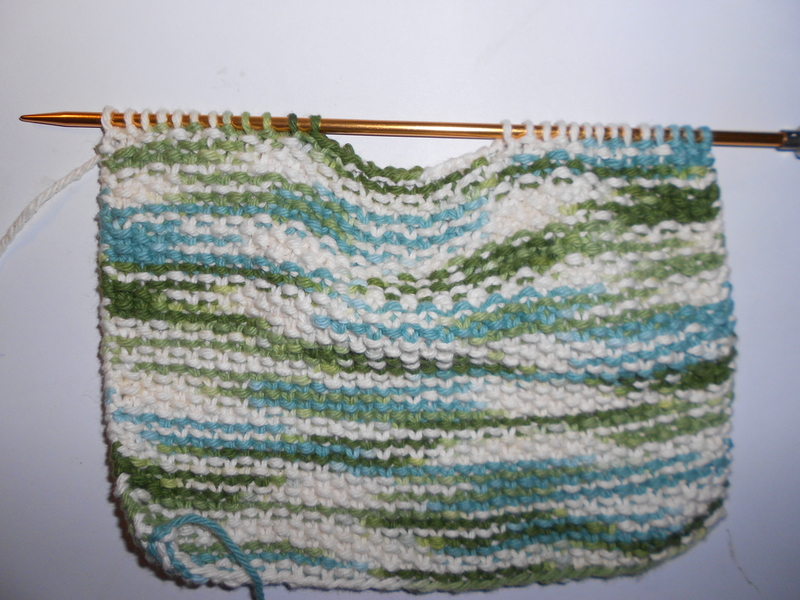 Start knitting the second strap, decreasing one stitch at the neck each row until you have 9 stitches. Work those stitches in pattern until the strap is about 6 1/2 inches long. 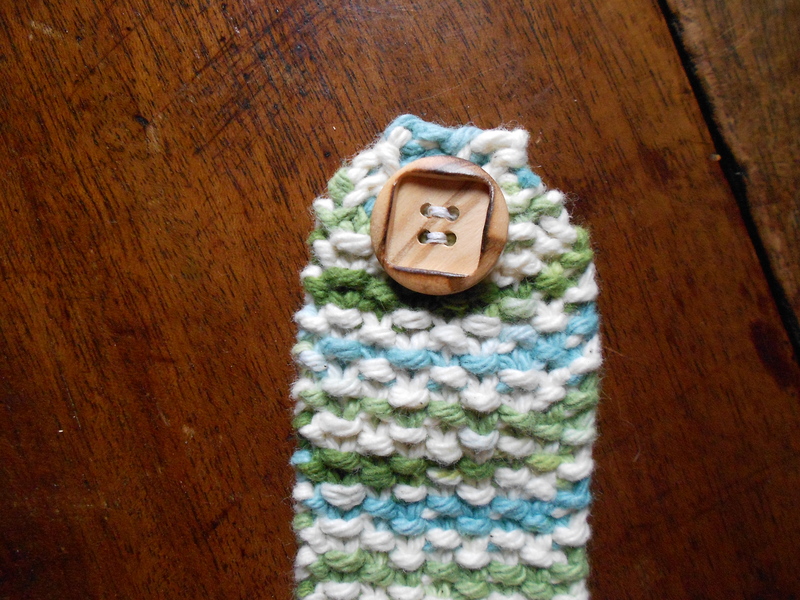 The button hole: I know there are some fancy ways to make a button hole, but this isn’t exactly a fancy bib, so I work 3 stitches, cast off 3 stitches and then work the last 3. 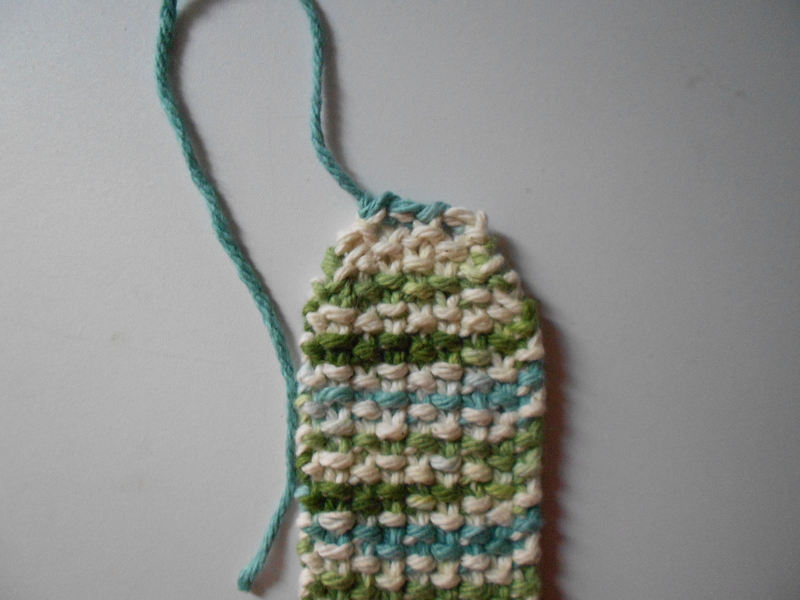 Then, turn the strap, work 3 stitches, cast on 3 stitches using a crochet hook or just yarn overs, then work the last 3 stitches. 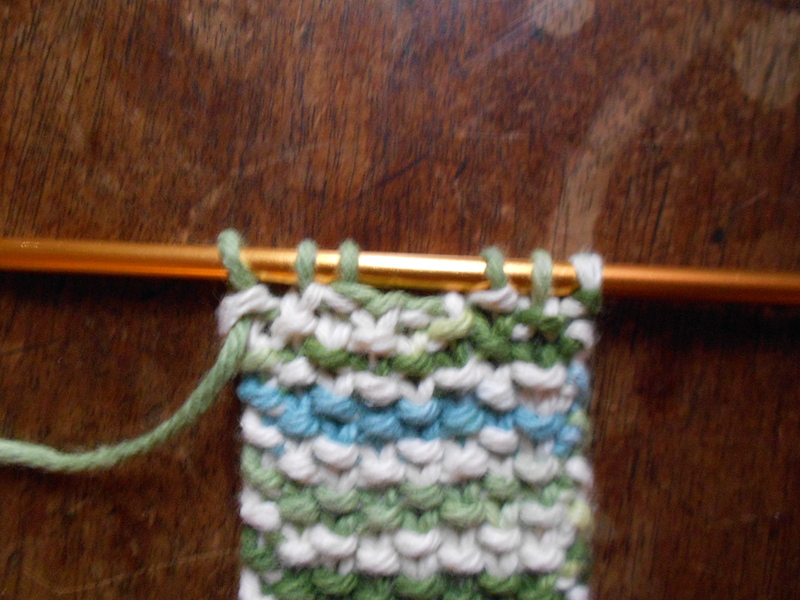 Same thing goes for this strap, I decrease at both ends of the next three rows, then bind off all the stitches. Now it’s time to weave in all the ends, which I find it is easiest to do this with a big-eyed needle and sew in the ends. This little trick changed my life and I no longer faint at the thought of having to weave in ends! Button time! I like these cute wooden ones because they are nice looking, but not real bulky – this is going to be behind some little sweetie’s neck and it needs to be comfortable. The bib, she is done! Ready to be packed off for the next baby shower to be attended, or maybe your own little one. Let me know if you have any comments or questions – feedback is always welcomed! It’s time for cooler weather- at least here in Vermont, and my mind is trying to reacquaint itself with the idea of *snow* and *below freezing temperatures*. It’s been a little hard for me to plan winter projects during weather which lends itself to suntans and barbeques, but as the breezes have chilled and the nights glisten in undecided frost, I have been able to actually think in terms of wool and warmth. I’ve added some pairs of fingerless gloves, as well as two absolutely gorgeous pillows that my Mom designed and created using second-hand wool sweaters and appliques. I love how autumnal they are, and so cozy! Makes me want to curl up with a cup of hot cider and read a good book of old poems. The Chunky Rustic Mug Sweaters are back in stock thanks to some long nights of knitting 🙂 and I am working on several new designs to be introduced in the next couple of weeks! The latest design in our summer line, keeping your mugs, bottles, cups and glasses well dressed for the season- the Basil Skies Cotton Summer Mug Sweater. Cool, clean, crisp – the fresh colors of pungent basil leaves, towering white clouds are knitted together in a simple cable design and embellished with a single spot of blue sky. Ready to be used to wick away moisture from your cold drink, or to save your hands from the warmth of a cup of early morning tea. 100% USA grown cotton, hand-knit in Vermont, by me! Roughly 10 inches long with a single button closure.